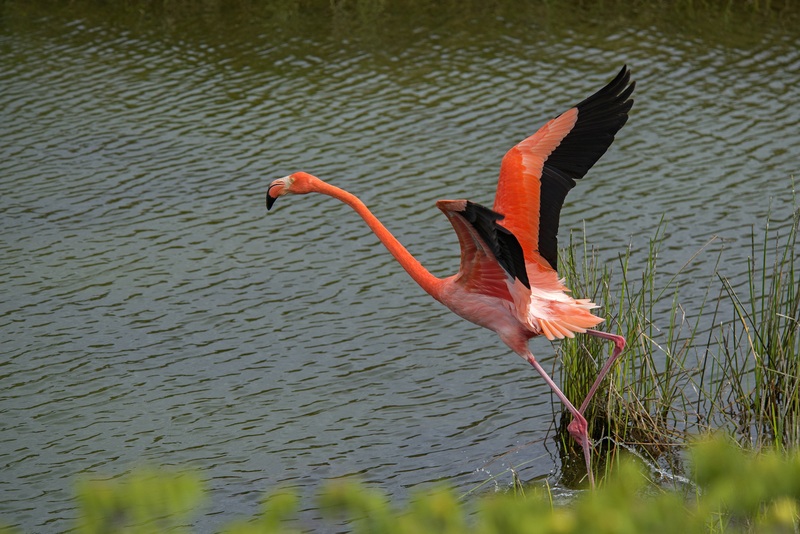 The American flamingo is well known for having fluorescent pink feathers and a flexible neck. 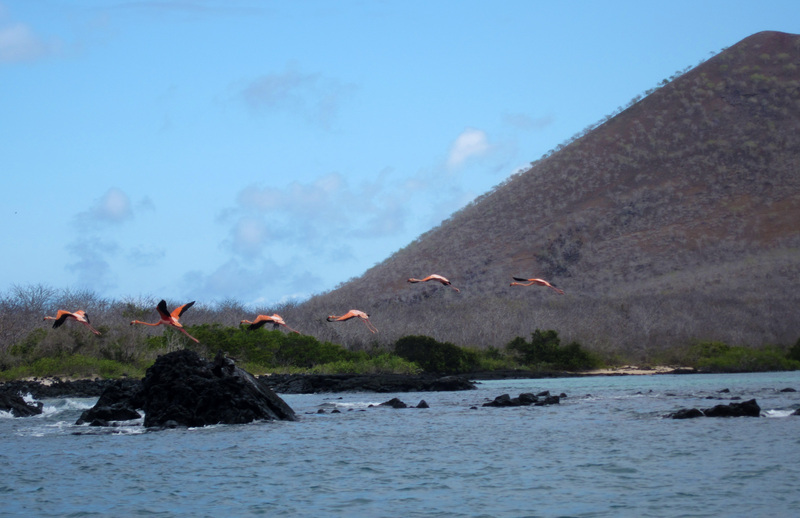 Galapagos is home to a small population of a few hundred flamingos. 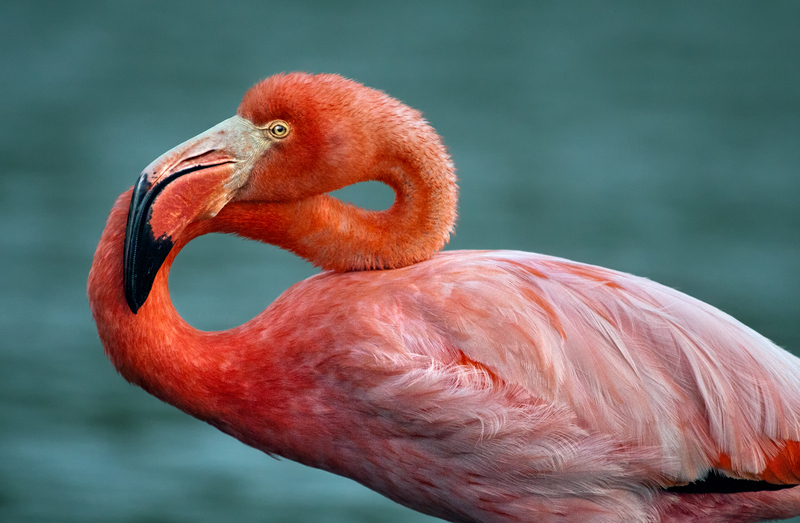 The American (or Caribbean) flamingo is one of six species of flamingo across the world. They breed in Galapagos, and across the Caribbean. The population in Galapagos differs genetically from that in the Caribbean, the Galapagos flamingos are significantly smaller, exhibit differences in body shape and sexual dimorphism, and lay smaller eggs. These large majestic birds vary in shades of pink and have black tipped wings which are only visible in flight. Like all flamingo species, the pink colouration is determined by the amount of carotenoid pigment that is ingested. 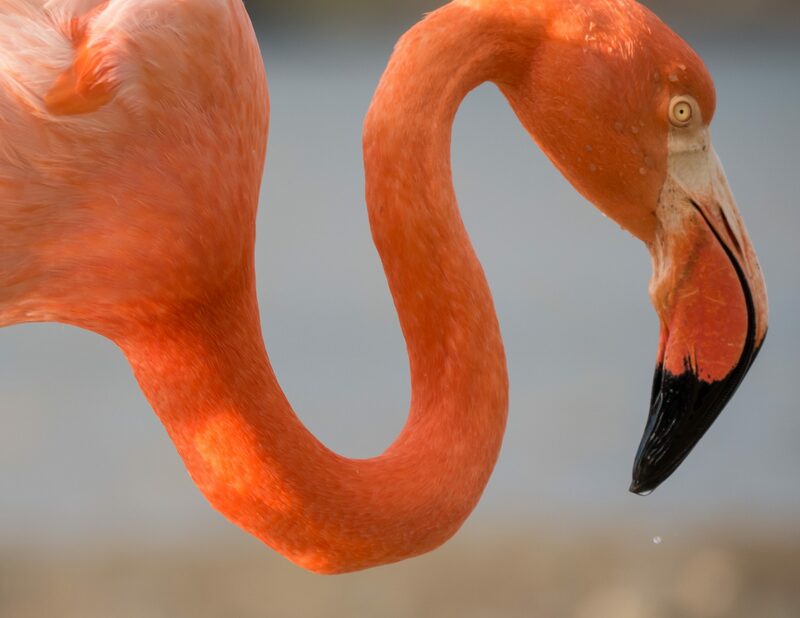 These pigments are found in the flamingo’s food sources – algae, crustaceans and microscopic plant materials, and the more flamingo consumes the stronger its intensity of pink. Although the pink colouration is most obvious in a flamingo’s plumage, the carotenoids also impregnate the bird’s tissues, skin, blood and even egg yolk. In Galapagos, flamingos have a varied diet of crustaceans, molluscs, worms, insects, plant material, algae and seeds. All flamingos have evolved an impressive way of feeding. First, they shuffle their feet to disturb the ground bringing up material that could potentially be food. They then walk along with their bills inverted and their heads upside-down under water. Their tongue acts as a piston, drawing in water which then leaves via the sides of the mouth. Within the bill are a series of filtering plates that strain water from mud and dirt. In order to mate, American flamingo colonies need shallow waters to perform synchronised courtship dances. Successful flamingos then nest and each female will lay a single egg. The nests are cone-shaped with a height of 20-25cm, and the egg is incubated by both parents for 30 days. Once the chick is born they leave their nest almost immediately and join a crèche of other chicks where roughly three adult birds will be on guard. The chicks are actually born a grey colour with a straight bill that takes three weeks to begin to curve and after 65-90 days they are able to fly. Flamingos are among a select few birds that feed their young directly from a secretion produced in their crop (throat), and even this ‘crop milk’ is bright pink from the carotenoid. So much carotenoid is taken up during rearing by their eggs and crop milk that by the end of a breeding season parents of both sexes have lost the pink colouring from their feathers and appear almost white. Where to see them: American flamingos can be found in brackish lagoons close to beaches but, due to their small population, are difficult to find. The top places to spot the flamingos are in Punta Cormorant lagoon, Floreana – and Quinta Playa or Puerto Villamil on Isabela. They can also be found in Punta Moreno, Isabela, Bahia Tortuga and Las Bachas on Santa Cruz and Puerto Egas on Santiago. When to see them: American flamingos can be seen in lagoons around the nesting period from March to July and when they are foraging. Threats: Breeding success is dependent on nest disturbance because parent flamingos desert their nests if they have been disturbed. This potentially makes flamingo eggs very vulnerable. Nests are under threat from predation by introduced feral pigs which eat eggs and have been reported to eat chicks, disturbance from sea lions and rising water levels caused by El Niño. Conservation Actions: We are working with partners on the Restoring Floreana programme which aims to reintroduce species that have become locally extinct on Floreana. This includes restoring a balanced ecosystem using conservation and adaptive management techniques. Part of this project involves the removal of invasive species which would prevent flamingo nests from being disturbed. 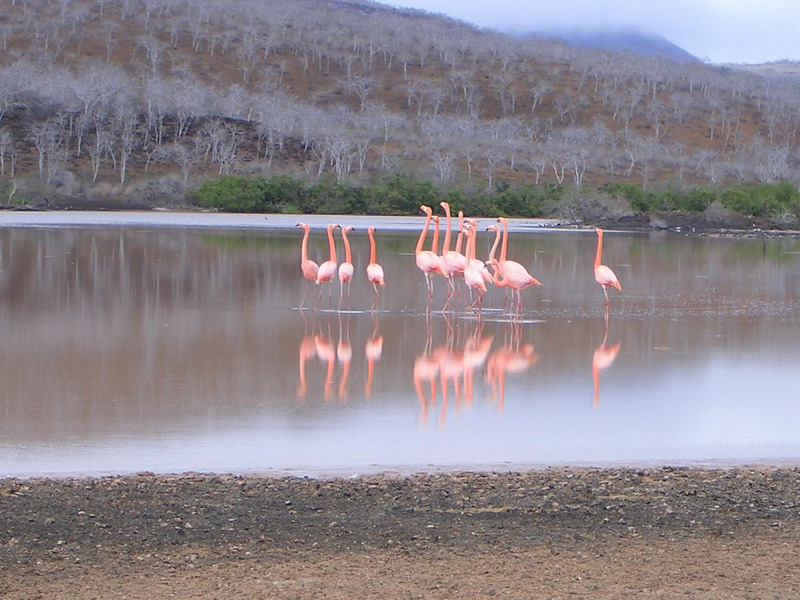 American flamingos are also protected by the Galapagos Marine Reserve and the National Park. Help us to protect vulnerable species in Galapagos by donating today! Can you help Galapagos wildlife? There are many ways to support our vision for a sustainable Galapagos: why not adopt an animal, become a GCT member, or donate today?